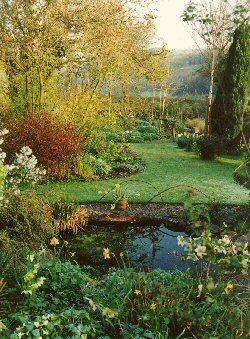 A one acre plantsman's garden situated 600ft above sea level at the eastern end of the Brendon Hills in West Somerset. It has been developed to blend sympathetically with the natural beauty of the surrounding countryside and to encourage wildlife. Island beds have been created to accommodate our ever growing collection of plants, chosen to give year round interest. The garden also contains many interesting and unusual trees and shrubs. 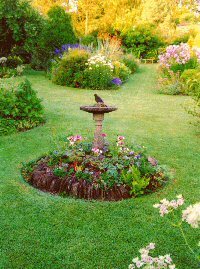 In 2000 we constructed a small wildlife pond to encourage frogs and toads into the garden. One night at the height of the mating season in February 2002 we had 18 frogs in the pond at once; in 2003, one afternoon at the end of February we counted 35 ; in 2004 we were back to around 20. This year (2017) we had around a dozen lots of frogspawn. Some areas of grass are left to seed for the wildlife and in spring wild primroses abound. We have built a new hedge-bank which has been planted with wild flowers with a hedge of mixed native species on top. We have a large bird population in the garden, including many thrushes, and in summer the garden is a haven for butterflies. An added attraction for visitors is that most plants seen in the garden can be purchased from the adjoining nursery. When the garden opens in March there is already plenty of colour with a large variety of hellebores, pulmonarias, primroses, narcissi and dwarf bulbs as well as interesting alpine areas. As the season progresses, herbaceous perennials and clematis become more evident. In May alliums, chaerophyllum and aquilegias give a colourful display as well as our wildflower areas. June is the peak time of flowering for our large collection of hardy geraniums (about 250). In late summer and autumn our collection of grasses is at its best; also looking good are crocosmias, heleniums and asters. 2008 saw the first summer since we have lived here that we had no house martins nesting. They returned in about 2013 and since then we usually have about 3 nests. The garden was featured on HTV's Garden Calendar in October 2000 and HTV's Roots and Shoots in March 2001. To see more photographs of the garden Click here.